Crafted with sustainable mango veneers finished in lightly distressed saddle brown, this modular wall desk and hutch is a no-nonsense piece that relies on functionality instead of frills with its clean drawer and door fronts and simply tapered feet. Ready to help you jump into work, the desk features two utility drawers for smaller office supplies, one center keyboard drawer, and three locking file drawers that hold both letter and legal size files. As if that weren’t enough, the hutch provides you with six open shelves, two fixed and four adjustable, for books and decorative accessories, plus two doors with two shelves behind for even more concealed organization space. 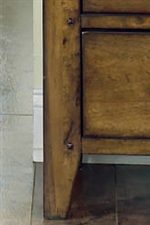 There is also a cutout at the base of the credenza hutch so that computer wires can be contained behind the unit. So get in the work zone and start pushing towards success with the Cross Country modular wall desk and hutch. The Cross Country Modular Wall Desk & Hutch by Aspenhome at AHFA in the area. Product availability may vary. Contact us for the most current availability on this product. 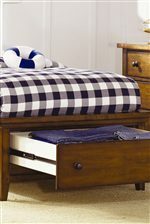 IMR-3024 Two Drawer Modular File 1 24" 21" 31"